If you want to go to Mars, you should probably hurry up and apply to be an astronaut. But if you want to explore Mars, there's another (much easier) way. 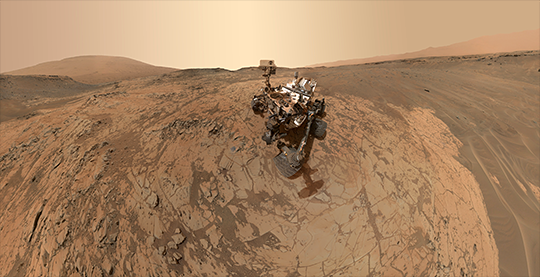 The video below gives you a 360-degree view of Mars from the perspective of NASA's Curiosity rover. The video is made from stitched-together images taken by the rover on Dec. 18. You can see the still version here. According to NASA, the image shows the downwind face of Namib Dune. Curiosity is investigating these dunes — the first studied anywhere other than Earth — on its way to Mount Sharp. Namib is about 23 feet away from the rover in the video and rises about 16 feet off the ground. Orbiter photos suggest that the dunes in this field move as much as three feet every Earth year. Launched in 2012, the Curiosity rover had a two-year primary science mission. At this point it has just about doubled its expected lifespan and will continue to carry out scientific missions indefinitely.